Can Rashi on Chumash interpret a pasuk against halacha? תנו לב לזכור תמיד את יום השבת שאם נזדמן לו חלק יפה יהא מזמינו לשבת (Take heart to remember the Shabbos - if you find something nice place it aside for Shabbos). Rashi's source seems to be Beitzah 16. However the Gemora there records an argument between Bais Hillel and Bais Shamai how to prepare for Shabbos. Given that we rule according to Bais Hillel, why is Rashi here quoting according to Bais Shamai? I've heard from Rabbi Shalom Carmy that the reference to Beitzah is actually a printer's error and Rashi got this from this Mechilta D'Rabbi Yishmael, where it remains undisputed. Rashi didn't give a source, and it was the printer's perogative to give any and all sources he felt like. But say it is Mechilta. As a commenter at Mi Yodeya asks, how does that help? Isn't it still against Halacha, meaning like Bet Shammai instead of like Bet Hillel? I think that one can put forth the following points. What Rashi is doing in this perek is a running commentary, primarily adapted from the Mechilta. He is channeling the Mechilta for us. As such, if Mechilta has a comment of the sort Rashi would bring (uleaggada hameyashevet divrei hamikra), we would expect him to bring it, even if elsewhere, in a gemara somewhere, there is a dispute, and we rule against the position. Further, this is not the only place Rashi brings a midrash halacha which is against the paskened halacha. Some modern meforshei Rashi take note of this, and explain that Rashi will bring forth such a midrash if he feels that it is more along the lines of peshat, since his goal is a peshat-oriented commentary, as adopted / adapted from midrash. So indeed, Rashi can and will cite midrash which will be against decided halacha, on occasion. Rabbi Yosef Blau: When Did Yisro Come To Moshe? Rabbi Chaim Brovender: When Did Yitro Come? Rabbi Efrem Goldberg: Are We Properly Educating Tomorrow’s Mothers? Rabbi David Hirsch: Why is the parsha of Kabalas HaTorah called Yisro? Rabbi Aryeh Lebowitz: The Father In Law Has Opinions! Rabbi Moshe Taragin: Forget about it! Rabbi Mordechai Turoff: What's in a name? Rabbi Shmuel Wagner: What Made Yisro Believe? Rabbi Netanel Wiederblank: What was given at Sinai? Rabbi Eliezer Zwickler: What Kind of A Courtroom Is This? Rabbi Avraham Gordimer: Why Did Yisro Come? Rabbi Josh Hoffman: Stop People, What's That Sound? Predestination of the Fall of Yerushalayim - Could It Have Been Avoided? Rabbi Shimon ben Lakish said, 'I will kill or be killed' (lit: Until I kill (or) I will be killed. i.e. I will try to save him, by killing all his captors, or will die in the process. We know from elsewhere that Rabbi Shimon ben Lakish was a bandit, skilled in weapons, before he repented and became a scholar.) I will go and save him by force. He went and persuaded them (convinced them to turn R Ami over, perhaps with threats) and they gave him over to him. He (R Yochanan) said to them, 'that which was in your hearts to do to him should come to pass on you.' They did not reach Apipsiros before they all went (died). Note that neither Rabbi Yonatan nor Resh Lakish simply sat down and studied. They didn't have as much bitachon as modern-day chareidim. Rabbi Chaim Brovender: Ma Titzak Eli? Rabbi Menachem Leibtag: An "outstreched hand" for "stressed out" nation: Who needed the "yad ha’chazaka", and why was is so important? Dr. Rebecca Press Schwartz: What's So Bad About Amalek Anyway? Rabbi Shmuel Goldin: A Culinary Crucible? Rambam and the Torah/Science Debate – Solving the Riddle! Hebrew etymologies for English words? This is a popular exercise in kiruv circles, to show a bunch of English or foreign language words and "show" that they came from Hebrew, thus demonstrating the historicity of the Tower of Bavel incident in sefer Bereishit. 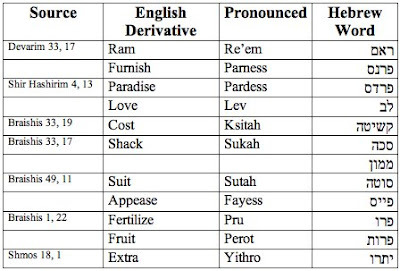 However, while some words do ultimately derive from Hebrew, in other cases, Hebrew (both Biblical and Mishnaic) borrowed words from other languages. In other instances, such etymological proofs rely on the present surface form of the word, and its similarity to a Hebrew form, ignoring that the surface form of the word was different in the past. These are what are called "false cognates". They have the same form and the same meaning, more or less, but they derive from different sources. Here I'll analyze a post that gives some awful etymologies, to "prove" a connection between Hebrew and English words. English dictionaries trace words back to Latin. But they go no further. It only makes sense most languages, including Latin derivatives, derive from the first universal language ever spoken, Biblical Hebrew. The Torah explicitly tells us that until the Tower of Babylon story, the world's populace spoke - only Hebrew (Braishis 11:1). Probably Hashem mixed up the universal language of Hebrew into 70 different languages at the Tower of Babel; The "mix-up" probably kept the original language as a sort of "parent" to the derived words; But that is my guess. mid-15c., from Middle French furniss-, prp. stem of furnir "furnish, accomplish," from Old French fornir (12c. ), from Vulgar Latin *fornire, alteration of *fromire, from West Germanic *frumjan "forward movement, advancement" (cf. Old High German frumjan "to do, execute, provide"), from P.Gmc. *fram- "forwards" (see from). Meaning "to provide" (something) is from 1520s. That is, go back far enough, to when it supposedly branched off from Hebrew, and we will see that the "sh" ending disappears. So we can no longer match the -sh ending of Furnish to the -s ending of Parnas. Furthermore, the n was not originally an n, but rather an m. Maybe that m is from an initial n, but the surface similarity is no longer compelling. Furthermore, we see that "furnish" initially comes for the P.Gmc word "fram", meaning "forwards". Further, the purported Hebrew etymology did not even consider that the -ish ending was morphology, rather than root. Compare to the words polish and brandish. Finally, the word "furnish" did not always mean "to provide". It only had that meaning from the 1520s, which was much later than the tower of Bavel. So Parnas / Furnish does not historically match in form nor meaning. Most targets of this kiruv argument are not sophisticated enough to spot the obvious error. Indeed, most proponents of this kiruv argument are not sophisticated enough to spot that they are making an error. c.1300, "attendance at court, the company attending," also their livery or uniform, via Anglo-French siwte, from Old French suitte "attendance, act of following," from Gallo-Romance *sequita, fem. of *sequitus, from Latin secutus, pp. of sequi "to attend, follow" (see sequel). Meaning "application to a court for justice, lawsuit" is first recorded early 15c. Meaning "set of clothes to be worn together" is attested from early 15c., from notion of the livery or uniform of court attendants (a sense recorded from late 13c.). Trace it as far back as Latin, and you have an extra letter c or q in the middle. And possibly that t disappears as well. The surface forms no longer match. Furthermore, the meaning of "a set of clothes to be worn together" traces back to the 15th century, or maybe to the 13th century. Earlier than that, it does not mean clothes. It means "to attend, follow". So the meanings no longer match. c.1300, murdre, from Old English morðor (plural morþras) "secret killing of a person, unlawful killing," also "mortal sin, crime; punishment, torment, misery," from P.Gmc. *murthra- (cf. Goth maurþr, and, from a variant form of the same root, Old Saxon morth, Old Frisian morth, Old Norse morð, Middle Dutch moort, Dutch moord, German Mord "murder"), from PIE *mrtro-, from root *mer- "to die" (see mortal (adj.)). The spelling with -d- probably reflects influence of Anglo-French murdre, from Old French mordre, from Medieval Latin murdrum, from the Germanic root. Old English myrðrian, from P.Gmc. *murthjan (cf. Old High German murdran, German mördren, Gothic maurþjan; see murder (n.)). Related: Murdered; murdering. This Hebrew derivation is just someone making an etymology up, and people are too polite or ignorant to point out that this is just making things up. c.1300 "to reconcile," from Anglo-French apeser, Old French apaisier "to pacify, make peace, appease, be reconciled, placate" (12c. ), from the phrase a paisier "bring to peace," from a "to" (see ad-) + pais, from Latin pacem (nom. pax) "peace" (see peace). That is, it has the meaning to reconcile as far back as the 12th century, based on the Old French. But that is from a phrase a paisier, "to bring peace". The French word pais does not mean reconcile but peace, and comes from Latin pacem. So, back in Latin, it does not have the same meaning of reconciling or placating. Words take many forms and meanings over the years. And it is an error to assume that the surface form and meaning of a modern English word was the same as it was way back when the purported borrowing occurred. Rather, due to the shifts in meaning and form, by mere accident, two words in parallel languages might readily form a false cognate. Is Chuck Hagel an Amalekite? Did הבתים transform into ויבן?